f you are compiling stk yourself note that it is recommended to use the current "1.7 stable" irrlicht branch, see http://irrlicht.svn.sourceforge.net/viewvc/irrlicht/branches/releases/1.7 (which will become the next 1.7.2 release). While STK mostly still works with irrlicht 1.7.1, bugs in this irrlicht version can result in some texts not being displayed, and even in crashes (mostly in menus though). This version shows very much work in progress, but we are getting closer to a release candidate. Hopefully this will motivate some artists to help us port/create a few more tracks, while we are busy fixing bugs and tuning some settings. Many challenges and GPs will be unavailable due to not-yet-converted tracks. The 'networking' menu is used to test the win/lose GP and unlocking animations. There is no networking support in 0.7 alpha 3 (nor will there be any in 0.7). Not all tracks have collectibles. AI needs tweaks, it does too good a job with slipstreaming, and on the other hand doesn't handle multiple items good enough. Disabling or enabling sound effects may require to restart STK for the change to apply correctly. Switching to windowed mode from fullscreen may fail on linux. If you build with irrlicht 1.7.1, you may get an empty race paused screen and/or a broken "feature unlocked" screen. If you do not exactly cross the lap line your lap may not be counted. If you add too many AI karts, the race may not start properly. In the kart selection screen, large karts might get clipped on sides. The game may not allow you to configure bindings for gamepads other than the first one. 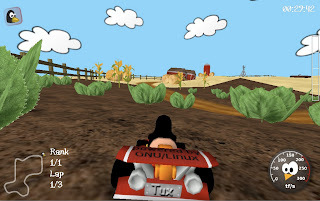 The "slipstream" (follow behind a kart for a while with the slipstream effect showing, and you will get a zipper-like boost) and quick-start feature (press start very quickly _after_ 'GO') need tweaks. I gave it a try again and ran into the same problem I have always encountered while compiling on my linux box: symbol lookup error: /usr/lib64/libIrrlicht.so.1.7: undefined symbol: XF86VidModeQueryExtension. I am guessing that this is not a STK problem, but rather a irrlicht problem, so I will give the SVN of Irrlicht a try. I am excited to see the progression of STK, and at the least will be able to play it next week when I get my laptop back. Insane: I suspect that you don't have libXf86vm installed, which is apparently necessary on your system. But this should actually be detected by our configure. 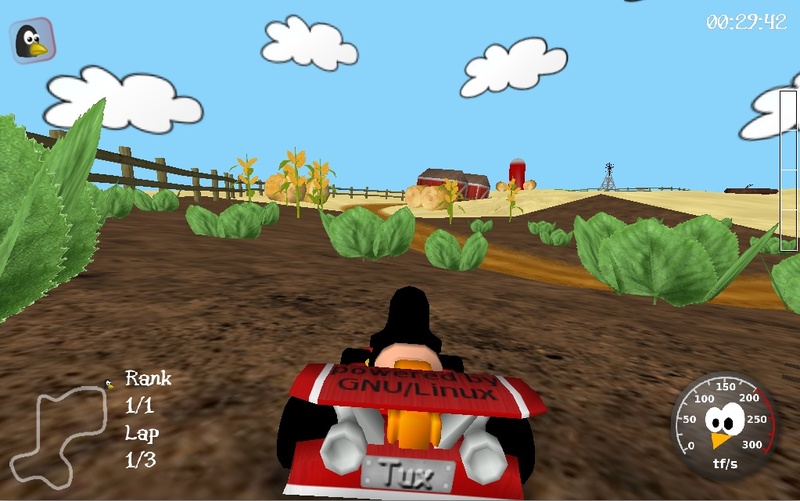 Could you perhaps post your config.log file in our forum (http://supertuxkart.sourceforge.net/forum), or to the email list? Then we can try to figure out exactly what is happening, and improve this. Ryan: this is the very old 1.7.0 version. Unfortunately there is (afaik) no ready-to-download version of 1.7.2 beta yet, you have to use SVN (or use 1.7.1, and accept that there are some minor problems). @Joerg: I think I misunderstood what Auria said. It is recommended to use the "branches/releases/1.7" as the SVN root, which will be the future 1.7.2 release, NOT the original 1.7 stable release. Thanks for the clarification. Just wondering, but did you guys ever think about making a Beastie character? Just played alpha 3 (well the PPA) and I loved it! very nice to see and the slipstream is a big enhancement! Are you dumping the beach track- it doesn seem to be in the latest SVN, it was probobly my least fovorite track.